The Life of Bon: What did you do TODAY? TODAY I beat my best friend in tennis. The wind was a blowing like crazy and I'm pretty sure it was working to my advantage, but still I beat her. I ain't never complained about winning! Also, it is getting harder and harder to bend over to pick up tennis balls. TODAY a senior boy unfolded to me the reason why it is easier to be a girl than a boy. Everyone in his P.E. class apparently thinks he's an idiot because he has no athletic ability. Well, if he were a girl than he would be treated normally because "everyone just assumes girls have no athletic ability and it's okay." He said this with a completely straight face. In front of the entire class of 40 eighteen year olds. And how does a teacher respond to a thing like that? TODAY I had to talk to one of my favorite students who plagiarized his most recent paper. I always hate those conversations. "Which part of it is plagiarized?" he asked sincerely. I guess he had nothing to say to that. TODAY Greg cooked a frozen pizza and vacuumed the floor while I tried to teach my dog how to stay with a little piece of Italian sausage. The moment felt perfect. TODAY was magic in my fourth period. The discussion was excellent, the students were engaged and curious, everyone was deeply immersed in the book. It didn't feel like school gets out in a month and it didn't feel like everyone had senioritis. It was 30 minutes of fourth period bliss. TODAY I wrote fifteen minutes in my book. If I can write at least fifteen minutes a day then I am still working toward my goal. TODAY I had a 20 ounce diet Dr. Pepper at lunch and it was divine. TODAY I had extra traffic on my blog from a guest post I did over on Helene's blog. Thanks Helene for having me and welcome new friends! TODAY I've got Kylie telling every married person out there why they should be glad they're married and making every single person realize they're dating life ain't that bad. Here with the worst dating story of all time is Kyyyyllllllie! Hey guys! I'm Kylie and I blog over at Kylie Gwen. I'm super excited to get the chance to be here on Bonnie's blog today! I figured I could spend time introducing myself but when I thought about it I realized a disastrous dating story will always be more entertaining. I'm sure by now you have all heard of a little app called Tinder. It's basically a newer improved version of "hot or not". Swipe right if you're interested, swipe left if you're not. I'm guilty of using this app, even though it immediately got deleted after it provided me with this gem of a guy. It was back in December. We started talking and I agreed to a date. He seemed normal. Key word being seemed. We had plans to go to dinner and a movie. Even though I'm not a fan of a movie on a first date I decided I had nothing to lose. This date happened to fall on the biggest snow storm we had had all year. We're talking snowing for hours, 6 inches on the roads, you probably shouldn't go anywhere cause you'll probably die, snow storm. He picked me up and we headed to dinner. 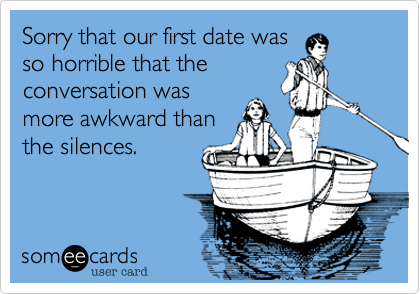 I'll be honest, it was one of those dates that was awkward from start to finish. The whole thing was pretty much doomed from the start. We got to dinner and he wasn't super talkative. He wasn't completely quiet but quiet enough that I had to continually come up with conversation topics to the point that it was anything but a naturally flowing conversation. We ordered and it wasn't less than 2 minutes later I looked over and saw my aunt, uncle, and cousins across the restaurant. I was actually relieved to see them because it gave me a slight distraction from the impending awkwardness at my table. We got our food and he barely ate any of his sandwich. We're talking he maybe took two bites and I'm sorry but if you're going to put an Applebee's oriental chicken salad in front of this girl, girl's gonna eat. He basically sat there and just stared at me while I downed my salad. Normally, I would've been super self conscious and all but at this point I had kind of already realized that this date was just not happenin'. A few minutes later our waiter came over and told us that someone had paid for our dinner. It was obviously my uncle. My date didn't say two words about it. At. All. It kind of shocked me. We were getting ready to leave and he didn't want to take his practically untouched meal home with him (I'm a big believer in doggy bags haha) and he didn't even think about leaving a tip. I mentioned something about leaving a tip and he just kinda stared at me. I wasn't about to leave without acknowledging the decent service we got so I grabbed cash out of my wallet and left it on the table. End dinner scene. We got in the car and I figured we would be on our way to a movie. I asked him what movie we were going to and it was then that he informed me we'd actually just be going to his house to watch a movie (he still lived at home). I was in shock and didn't know what to say because when he asked me out he specifically said we would go see a movie in theaters. He lived across the valley from me which made for a scary drive in the snow and I was sure I was going to die. Part of me was wishing we'd get in a fender bender so that this date could end right then and there. That's how incredibly uncomfortable this date was. Little did I know how much more awkward it would get in the next half hour. We got to his parents house and we went into the TV room. His mom and dad were cuddled up on the couch watching the old school Rudolph movie. So what did we do until their movie was over? We stood in the room awkwardly. We're talking 15 minutes of just standing there hovering over his parents. I can't even express the level of awkward at this point in the night. Their movie finally got over and they got up and left the room. I asked him what movie we were going to watch and he told me he was super laid back and didn't care and that I should pick. I was trying to be nice and asked his opinion on movies while trying to pick one out. They had a stack of Christmas movies sitting there and I figured this was a good way to go. I instantly snatched them up, started flipping them over, and looking for that microscopic number that told me just how much longer I'd have to be there. Yes, I was basing my decision off of how many minutes the movies were. I was trying to decide quickly and chose How The Grinch Stole Christmas, the one with Jim Carrey. He looked at me and then informed me that, "well, I don't like that movie." So, I picked another Christmas movie. He proceeded to do that to all three movies I picked. I finally told him to decide. You know what he picked? The Lake House. Unfortunately the story doesn't end there. It also unfortunately didn't end after he dropped me off that night either. If you're interested in what happened you can check it out here. How did you discover that he had plagiarized his paper? Ugh, I hate those conversations. Sadly, it starts early... I caught two of my fifth graders plagiarize this year on different projects and it really frustrated me. I hope they learned something from it so they don't fall into even deeper trouble when they're older. Lol kids are funny, they dont even try to get out of it anymore...times have changed! Omg that date sounds horrid I would have told him to take me home! I love the TODAYs as a device. Plagiarism, awful. Just so lazy and pointless. I miss that fourth period oh so much. Also, hooray for Greg getting a teaching job!!! Woohoo! That's horrible that you found out he plagiarized his paper. Even more horrible that it was a favorite student. You must have felt so disappointed. I know I would have. Today I had a whole 20oz Pepsi since I don't have to work early tomorrow, and holy moly was it amazing.